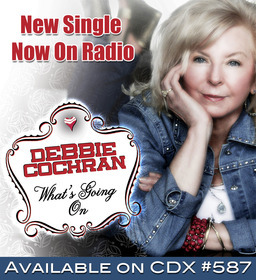 Striking the same vein with Tammy Wynette's fifteenth #1 single 'Til I Can Make It On My Own, classic country artist Debbie Cochran returns to the scene with the release of What's Going On (CDX #587). With high demands hitting the airwaves, stations like WAXO (Lewisburg, TN), WTNQ (LaFollette, TN), WBDC (Jasper, IN), and WMMG (Brandenburg, KY) already added it to their playlist. "It was very emotional when I watched legendary Glen Campbell talking about his Goodbye Farewell Tour," said Debbie. "It broke to my heart since I watched my father-in-law slowly disappear with Alzheimer's as well." Debbie is winning the hearts of radio stations and music fans nationwide and is an inspiration to those who still have dreams they want to achieve. She has dedicated her Golden years to pursuing her childhood dream of being a singer and performer. With several albums and singles under her belt, including earning the DisCovery Award from renowned music critic, Robert K. Oermann, you could say that Debbie is doing what her heart has always desired. With influences like Reba McEntire, Loretta Lynn and Kitty Wells, Debbie portrays a 'halo-country,' wholesome sound that listeners resonate with. This single is off her latest project produced by Grammy nominated Kent Wells (Dolly Parton), Before We Met The World, and includes her previous single When You're Loving Me. Throughout this endeavor, Debbie's husband, Elmer, is a great supporter for her ambitions and even built her an Opry stage in their hometown of Batesville, AR. "I find myself getting lost in the music and I can't praise my husband enough for his patience," says Debbie. "I can't recall all the times that he's snapped his fingers and asked me, 'Are you here or in Nashville?'" Debbie lives her motto everyday and her very first single by saying "It's Never Too Late" when she steps into the studio, writes new material or hits the center stage. For more information, visit www.DebbieCochran.com or www.facebook.com/DebbieCochranMusic. For media requests, contact PLA Media at 615-327-0100.